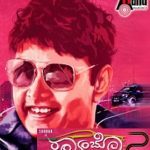 Bit Hogbeda Nanna Song Lyrics | Raambo 2: Bit Hogbeda Nanna is a song from an upcoming 2018 Kannada movie Raambo 2 [Rambo 2], directed by Anil Kumar. The film is being produced by Sharan and Atlanta Nagendra under the banner Laddoo Films. The movie is co- produced by Arjun Janya [music composer] and technicians Sudhakar Raj [cinematographer], K M Prakash [editor] will be working partners for the film. Raambo 2 features Sharan, Ashika, Ranganath and others. Aanand Audio is the music label of this movie. This song was composed by Arjun Janya with lyrics penned by Santosh Naik. Bit Hogbeda Nanna song was rendered by Singer Mehboob Saab. Bit Hogbeda Nanna is a pathos song where the lover is asking her girl to not leave him. Mehboob Saab has sung this song well. We will try to translate the lyrics to hindi asap.